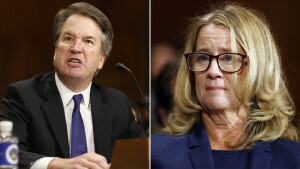 The contrast between Dr. Ford’s “I’m so sorry; I don’t remember” and her efforts to make the people questioning her “like” her was magnified 100 percent by Kavanaugh’s belligerent, arrogant, disrespectful behavior. Every male pundit who praised the way she presented herself showed he had no understanding of what it takes to win in this environment. She was believable because she made you like her. She was believable because she apologized. She was believable because she was overcautious in everything she said. Most important, she was believable because she was not threatening in any way. He was not believable. And it didn’t matter. With his bullying and by instilling a fear of reprisal, he silenced those who would’ve stood up for her. It’s easy to lull a group into silence that way. You can hide in plain sight in silence when there are others doing the same thing. And no one was afraid of her reprisal if he or she didn’t come forward to support her. Many of my friends contacted me during the testimony to say they were weeping — and in some cases, they said they didn’t even know why. A few said they were crying because they felt so badly for her. Empathy is a great thing — and she certainly won the empathy contest — but unfortunately, that wasn’t what yesterday was about. For those of us who weren’t quite sure why we became so emotional, perhaps it’s because the disease to please appeared alive and well in Ford. And the attack, attack, attack to win exhibited by the candidate for the highest court in the land still stands in our society as a methodology that can’t be countered with any semblance of decency. Our desire to please and to compromise, to bring consensus to any major decision will always be my preferred methodology. But when going up against a GOP type of fighter, it’s like going into a Wimbledon finals match with a badminton racket. And what makes it all worse is that I’m not willing to do what it would take to fight their way. So the hope that things have changed since Anita Hill testified 27 years ago were dashed yesterday. I believe Kavanaugh will be confirmed. I believe his wife will lose any sense of self-respect she might have had. I believe that most of the men in that room have zero respect for women. I believe we don’t know how to demand or earn that respect. I believe the gender differences are greater today than they were 30 years ago. I believe that we have to take it to the polls. We will never win in a fight like the one we saw yesterday. We will only win when more decent people are in office. This same friend often tells me that ‘reason speaks softly but screams to be heard.’ Yesterday, Dr. Ford spoke softly, filled with reasoned certainty. Sometimes it’s hard for reason to be heard over the bullying raised voices of men like Kavanaugh and Graham. We’ll see.